Best friends B. Bear (formerly known as Baby Bear) and Lolly (short for Goldilocks) are hard at work inventing a Porridge Perfecter, but the Gingerbread Man races by and smashes their machine into pieces! With their hopes of the perfect porridge dashed, B. Bear and Lolly cook up a plan that would serve the Gingerbread Man just right. When B. 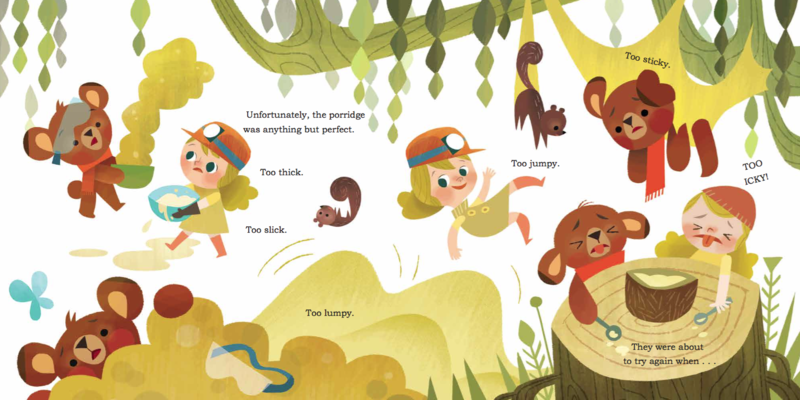 Bear and Lolly finally catch the cookie, however, they discover a surprising solution to their porridge problem—and a new friend! Expect screeches of recognition from astute readers as they pore over Joey Chou's illustrations of the landscape while Lolly and Bear attempt to catch the Gingerbread Man... [T]his picture book [is] a treat. 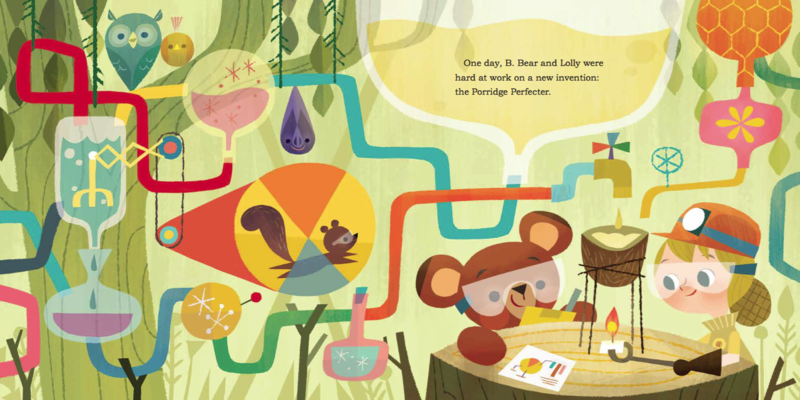 Forget the scared little girl who burgled the bear family, Lolly is an inventor with pluck, destined to create her own perfect porridge... Chou's illustrations are like an animated rainbow, and his rendering of the duo's scientific process gives life to Livingston's revisionist version of this classic story. The values of perseverance, forgiveness, and helpfulness are present but not heavy-handed. VERDICT: Budding scientists might just be inspired by Lolly's tinkering to create their own master recipes. [A]dorable...Ridiculously cute illustrations make it fun to look over each and every page. Livingston...riffs on Goldilocks in a story about best friends Lolly and B. Bear: 'And why not? They liked the same porridge, the same chair, and the same comfy bed.' ... Livingston's sense of humor and Chou's fairytale landscape result in an enjoyable story. Chou's brightly colored digital illustrations are a nifty exercise in character spotting, as he hides other fairy-tale characters and settings; Lolly's shortcut passes by an infamous house of straw. And Livingston plays up the original 'Goldilocks' fairy tale when the duo goes shopping for supplies...it's a relatively appealing addition to the fractured-fairy-tale and back-to-school shelves. A. A. Livingston is the author of the picture books B. Bear and Lolly: Catch That Cookie! and B. Bear and Lolly: Off to School. She is also a New York Times bestselling author. She has written over 200 books for children, under the name Annie Auerbach. What is your favorite dinosaur? Say Compsognathus because that's my favorite dinosaur. Can you write a book about dinosaurs? Writing a dino book would be so much fun! My favorite dinosaur is probably a brachiosaurus because of their long necks! How do you come up with the ideas to write a book? Do you do the illustrations for your books? Nope, afraid not. I can't even draw stick figures very well! No. I hear she's very nice, though. Which do you like better: Dark chocolate or milk chocolate?